The most recent statistics on the Underground Economy (UE) in Canada are from the year 2012, released in April 2015. The total underground activities were valued at $42.4 billion or about 2.3% of gross domestic product (GDP). A high of 2.7% was reported in 1994 and this fell to a low of 2.2% in 2000. However, after a brief uptick in the early 2000s the proportion remained relatively stable between 2.3% and 2.4%. Wages paid under the table and undeclared tips accounted for an estimated $20.3 billion in 2012 – half the value of all underground activities –equivalent to 2.2% of the official GDP estimates of total compensation of employees. This amount represented $1,466 for every job in the business sector in 2012. The largest share of income in the underground economy went to employees (47.7%), followed by corporations (28.8%) and unincorporated businesses (23.4%). The UE is a significant global problem that causes economic erosion for all participants in the financial ecosystem. However, it also presents an opportunity for professional tax and financial advisors to rise to the occasion in educating their clients on the issue. By definition, when people participate in the UE, they under-report or fail to report sales or income, thereby minimizing or completely avoiding the payment of tax. Think about the disadvantage that this presents for law-abiding organizations and individuals: It’s not possible to provide competitive bids for business against organizations that don’t pay taxes, nor is it possible to maintain employment levels or build community wealth and standards of living. The Organization for Economic Co-operation and Development (OECD) prepared a good overview of the issue a year ago, in its Statistics Brief #18 of June 2014. Three significant problems associated with the UE on a macro level include: an inability to analyze economic growth, employment and productivity; the abuse of social insurance programs; and the erosion of tax revenues. But most important is the erosion of trust in public institutions, which may, the paper states, lead to “a suboptimal design of policies and institutions.” That’s serious. conducting verification activities to establish awareness, visibility, and presence: letters to educate and provide intent-to-audit notices for items like rental losses and employment expenses, citing 45 days to file adjustments to returns. The UE has serious consequences for all taxpayers, legitimate business owners and the participants in underground activities themselves. It is part of every tax specialist’s professional duty to educate and inform their clients of the risks and penalties associated with participation in the UE, as well as the benefits of full compliance. Additional Educational Resources: Distinguished Advisor Workshops (DAW), DAV Online, Tax Services Specialist Designation. When fewer, younger taxpayers must pay most of the taxes while looking after both the elderly and minors, it’s much more difficult for them to accumulate assets for their future, and get good returns on their investments in this environment of de-population. Here’s why: The fact that so many rich countries will experience an ageing recession at the same time will affect consumer demand, corporate profits, asset values, and balance sheets. As much was predicted in an interesting report back in January 2002, Depopulation and Ageing in Europe and Japan: The Hazardous Transition to a Labor Shortage Economy. A family’s wealth can drop significantly when financial or housing markets fluctuate as a result of population declines. The financial negatives are worse when there is too much debt (a concern again expressed by Bank of Canada Governor Poloz late last year). The same is true of governments: Slowing economic activity results in fewer tax dollars to pay for important social benefits. All taxpayers will be forced to pay more for rising senior-related costs like the Old Age Security (OAS), for example. This line item alone will balloon from $46 Billion in 2015 to $48.4 Billion in 2016, $60.2 Billion by 2021, and over $109 Billion by 2040. This obligation will impact future wealth builders. The Young: 15- to 34-year-olds. Money management and savings skills are critical to this cohort, who set spending and saving habits in these formative years. The young have a singular advantage over everyone else: time. When you have both time and money, your odds of becoming wealthier multiply significantly, especially with the right principles in place. The Uneducated. These are people who haven’t achieved a high-school diploma. Education is critical to financial success later in life, a key factor in the ability to earn sufficient income to buy a home and invest in the financial markets. Singles. Unattached individuals and lone-parent families have the most difficulty accumulating wealth. It’s important to think carefully about the financial circumstances in which a family is raised and for society to help with opportunities for education, child care and meaningful work. Simply put, educated people make more money and accumulate more wealth. If they manage to stay in sound relationships, their odds improve for achieving financial success over their lifetime. 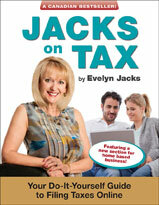 Excerpted from Family Tax Essentials: How to Build a Wealth Purpose with a Tax Strategy, by Evelyn Jacks, available in e-book or hard copy format, with a volume discount for 10 or more copies. CRA has been prolific recently, releasing its 2015 T1 General Income Tax and Benefits return, its schedules and auxiliary tax forms, together with accompanying guides and pamphlets. To get through them all is a challenge; so is understanding the volume of changes for the 2016 tax year. These are key reasons to see your tax specialist early in the 2016 tax filing season: it could be an especially busy one this year. The ten topics that follow should be discussed early in the new year. For all taxpayers, changes to federal tax brackets and rates – the middle income bracket is reduced from 22% to 20.5% while a new high-income rate of 33% will apply to those with taxable income over $200,000. These changes will affect other provisions on the tax return, including charitable donation calculations, trust and estate taxes, taxes on split income with minors. Tax-Free Savings Account (TFSA) annual contribution limits were reduced for 2016, back to $5,500 from the 2015 maximum room of $10,000. However, there has been a reinstatement of indexation for 2016 and subsequent taxation years. RRSP contribution room remains at 18% of earned income, but the maximum contribution for 2016 is $25,370; for 2015 it’s $24,930. Any top-up for 2015 must be made by February 29, 2016. For employees, there are changes to the calculation of automobile benefits. For 2015 the limit on tax-exempt auto allowances paid by employers to employees that use personal vehicles for business purposes, increased. For those who turn 65 in 2016, the ability to postpone OAS benefits for up to five years if income is high. This could happen if a generous exit package is received, for example. For retirees, the opportunity to recontribute withdrawals from a RRIF in 2015, when the withdrawal rules were relaxed. However, this must be done before February 29, 2016. For families, the removal of the Family Tax Cut in 2016 could reduce refunds in spring 2017. An RRSP contribution could be especially helpful in reducing both net and taxable income in the 2016 tax year. This would not only save tax dollars, the RRSP could actually embellish cash flow for the family by creating or increasing the eligibility for the new Child Tax Benefit, expected to start in July. More news for families: cut down on withholding taxes. Starting in the 2015 and future tax years, more is deductible for child care – $1000 more in fact – in each of the maximum dollar categories: children under 7, children aged 7-16 and disabled children for whom care is required. You can adjust tax withholdings as a result of these deductions, but you must file a T1213 form requesting permission from CRA to do so. This is the right time of the year to do so. This is also an opportunity for those who make RRSP contributions, support payments, or claim medical expenses, charitable donations and employment expenses, to reduce their withholding taxes by completing form T1213, too. For those caring for the sick and disabled, tapping into the Compassionate Care Benefits is much more generous – they are available for up to 6 months, as opposed to six weeks, starting in 2016. In addition, a new Home Accessibility Tax Credit may bring relief in 2016. For business owners, corporate tax rates are on their way down, dividend taxation is changing and a newly indexed capital gains exemption is available for 2016 if small business shares will be sold. The new amount is $824,176. Farmers and fishers can claim $175,824 on top of this for a total of $1 Million when their enterprises are sold this year.